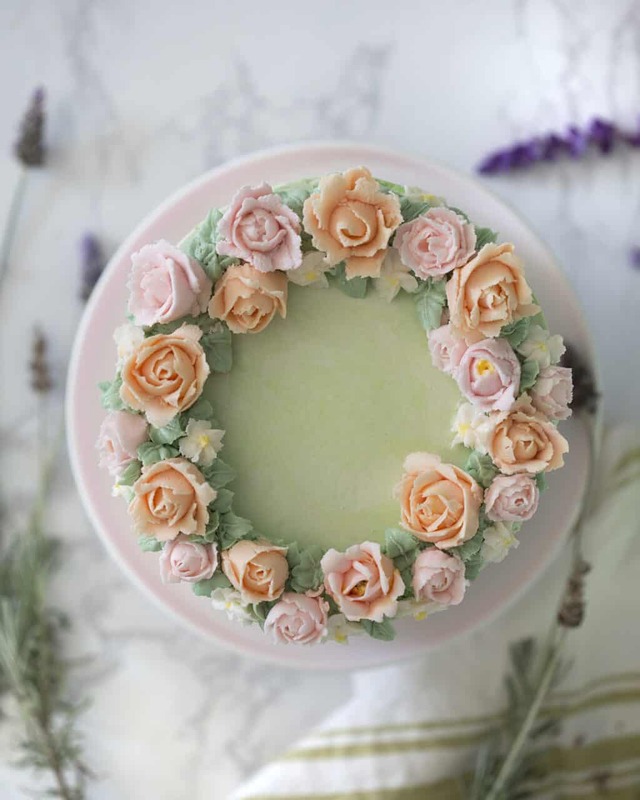 A delicious tea infused cake kissed with lavender. 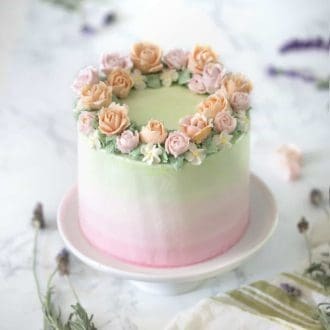 You can make this cake with a much simpler decoration scheme but since it’s the beginning of spring I wanted to go all out and do an Italian meringue buttercream in a pink to green ombré along with a wreath of flowers on top. It’s a lot of buttercream so you could easily scale back, and of course skip the flowers on top. If you’ve tried tis recipe out please leave a comment and rating! I love a nice relaxing afternoon tea, there’s something so wonderful about sitting with some friends or a good book and just enjoying a moment respite from an increasingly hectic world. I have recipes for an assortment of tea sandwiches and scones on the blog but I hadn’t gotten around to a proper dessert to accompany the tea. Petit fours are beautiful and can of course be delicious but they’re a whole art form that I haven’t gotten into yet. My solution was to make a tea flavored cake with a kiss of lavender. I steeped a beautiful vanilla tea in simmering milk along with some dried culinary lavender we from this beautiful farm in Oregon. I could have drank all the milk tea by itself but I love the delicate flavor it imparted to the cake! If you’re in a hurry/are not a fan of buttercream then you could make this recipe as a bundt cake or mini bunts and top it with a glaze made from confectioners’ sugar and a few tablespoons of the lavender milk tea. I might have to make that recipe and photograph it ASAP! Piping buttercream flowers can be intimidating but I have some tips for you. First off sift your powdered sugar, lumps are the enemy! Mix a stiff batch of buttercream for the flowers’ center cones upon which you will add the petals. Fill one side of your piping bag with a lighter shade of whichever color you’re using and make sure the sharp end of your petal tip is aligned with that side. You can also check out my rose cupcake post for more details. One more thing. When you’re mixing colors add the dye in little by little. I use a toothpick to swipe in some color then mix and add more if needed. If your colors look a but too bright add a TINY bit of black in to tone things down. What does lavender cake taste like? Lavender cake tastes like lavender smells. The key is to not use too much lavender flavor as it can become overpowering. I find that a drop of lavender extract with 1/2 a teaspoon of culinary lavender works wonderfully. What flavors does lavender go with? Lavender pairs wonderfully with tea so I infused my milk with a black tea, which gives a wonderful depth of flavor to the cake layers. Lavender also pairs very nicely with chocolate, honey, sage and most fruit flavors including lemon, and blueberry. 1. Preheat oven to 340F. Butter and flour three 6-inch cake pans. Soak baking strips in water. Sift dry ingredients (including sugar). Whisk to combine. 2. In a small saucepan over medium heat, combine milk, culinary lavender and loose black tea. Give it a quick stir. Let it simmer for about 10 minutes. Strain into a bowl to cool. Measure ½ cup for the batter. Reserve the rest for the buttercream. In a medium bowl, combine the wet ingredients and ½ cup of the infused milk. 3. Combine the wet and dry mixtures. Whisk until combined. If the batter is lumpy, it’s okay! Add the damp baking strips to the cake pans. Evenly distribute batter each pans. I like to use a kitchen scale for precision. Bake for about 35 minutes or until the centers are set and springy to the touch. 4. Beat the egg whites, salt and cream of tartar, slowly add in 1/3 cup of sugar and continue beating until soft peaks form. In a medium saucepan add the remaining sugar and 1/3 cup water then place on medium-low heat. Stir until sugar melts and becomes clear. Maintain at medium-high heat until temperature reads 235-240F. Drizzle the sugar into the mixer immediately. Run the mixer until meringue is cool/tepid. 5. Switch to a paddle attachment. Add room temperature butter into running mixer one tablespoon piece at a time. Add the salt and vanilla. Beat until butter is combined and mixture has reached a silky consistency. Distribute into multiple bowls. Use food coloring to create a gradient of colors. Transfer to piping bags. Snip off the tips of each bag. 6. In a stand mixer, cream the room temperature butter until fluffy. Sift in half of the confectioners sugar. Mix, then add the rest. Add in a few tbsps of the infused milk mixture until you reach a desired consistency. Add in 1 drop of lavender essential oil. Mix until combined. Reserve about 1 cup. Add in purple food coloring. Transfer to a piping bag. Add about the same amount of white to a piping bag. Add both the white and purple to one piping bag. Reserve about 1 cup for the roses. Dye with pink and orange food coloring. Transfer to a piping bag fitted with a 127 tip. Dye a small amount of buttercream green for a ring. Reserve a small amount for the white daisies. Transfer the remaining white buttercream to 1 large piping bag. 7. Cut a square of parchment paper. Use a tiny bit of buttercream to glue down the paper onto a piping nail. For the roses, pipe a small cone of very thick buttercream in the middle of the square. Use a 127 tip with the pointy side up to make the petals. Start with a spiral for the center. Pipe small arches for each petal, pointing the tip outward as you get towards the outer petals. For the daisies, add some white buttercream to a piping bag fitted with small petal tip. Pipe yellow in the center. 8. Pipe the purple lavender swirl between each layer. 9. Crumb coat the cake with the plain white buttercream. Smooth with a scraper and offset spatula. 10. Starting with the darkest pink, pipe the Italian Meringue gradient. Smooth with a scraper. Chill the cake for about 10-15 minutes. 11. Pipe a ring of green. 12. Attach flowers to the ring. 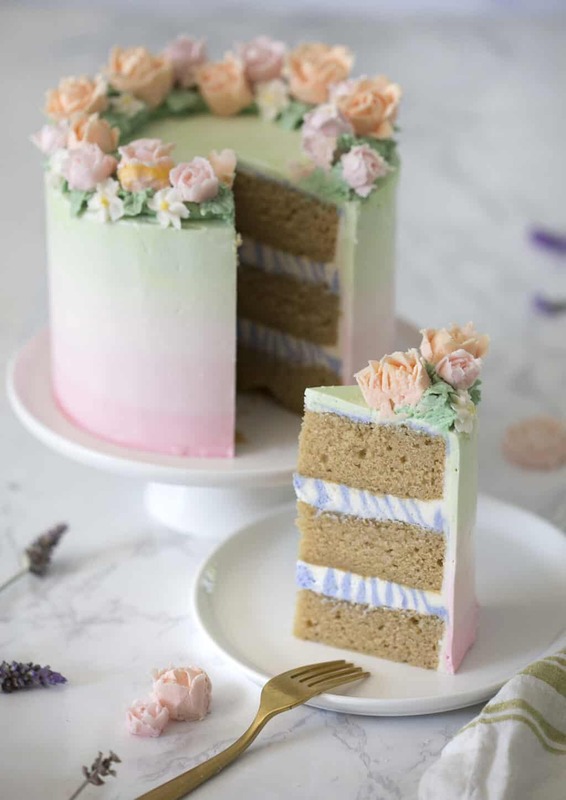 A moist layer cake flavored with vanilla tea and a kiss of lavender. In a small saucepan over medium heat, combine milk, culinary lavender and loose black tea. Give it a quick stir. Let it simmer for about 10 minutes. Strain into a bowl to cool. Measure ½ cup for the batter. Reserve the rest for the buttercream. In a medium bowl, combine the wet ingredients, including butter and ½ cup of the infused milk. Combine the wet and dry mixtures. Whisk until combined. Add damp baking strips to the cake pans. Evenly distribute batter into each pans. I like to use a kitchen scale for precision. Bake for about 30- 35 minutes or until the centers are set and springy to the touch. Run the mixer until meringue is cool/tepid, about 15 minutes. You can pack the bowl with ice or frozen peas if you want to speed the cooling down. Use food coloring to create a gradient of colors. Transfer to piping bags. Snip off the tips of each bag. In a stand mixer, cream the room temperature butter until fluffy. Add in a few tbsps of the infused milk mixture until you reach a desired consistency. Add in 2 drops of lavender essential oil. Mix until combined. Reserve about 1 cup. Add in purple food coloring. Transfer to a piping bag. Add about the same amount of white to a piping bag. Add both the white and purple to one piping bag. Reserve about 1 cup for the roses. Dye with pink and orange food coloring. Transfer to a piping bag fitted with a 127 tip. 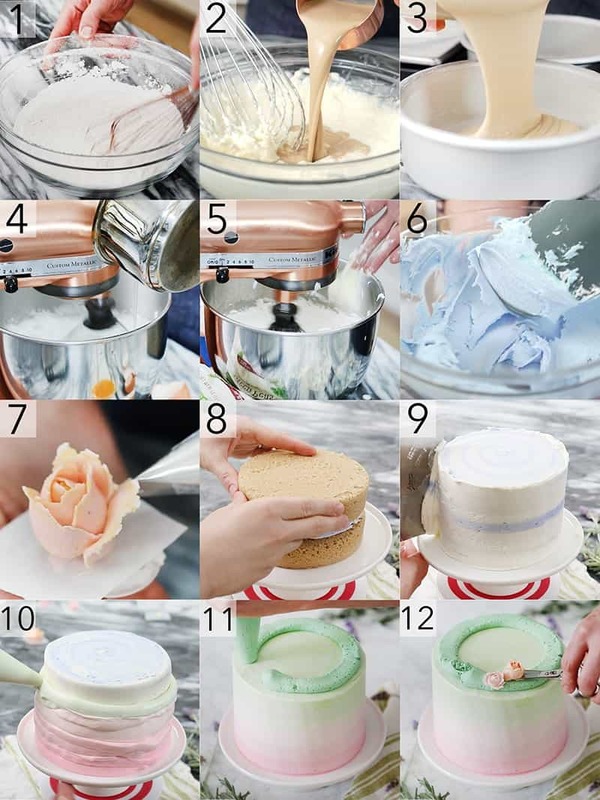 Dye a small amount of buttercream green for a ring, which will be the base of your flower wreath. Reserve a small amount for the white daisies. Transfer the remaining white buttercream to 1 large piping bag. Cut a square of parchment paper. Use a tiny bit of buttercream to glue down the paper onto a piping nail. For the roses, pipe a small cone of very thick buttercream in the middle of the square. Use a 127 tip with the pointy side up to make the petals. Start with a spiral for the center. Pipe small arches for each petal, pointing the tip outward as you get towards the outer petals. For the daisies, add some white buttercream to a piping bag fitted with small petal tip. Pipe yellow in the center. Pipe the purple lavender swirl between each layer. Crumb coat the cake with the plain white buttercream. Smooth with a scraper and offset spatula. Starting with the darkest pink, pipe the Italian Meringue gradient. Smooth cake with a scraper. Chill the cake for about 10-15 minutes. Pipe a ring of green. Attach flowers to the ring and pipe leaves to fill in the gaps. If you're in a hurry/are not a fan of buttercream then you could make this recipe as a bundt cake or mini bunts and top it with a glaze made from confectioners' sugar and a few tablespoons of the lavender milk tea. Piping buttercream flowers can be intimidating but I have some tips for you. First off sift your powdered sugar, lumps are the enemy! Mix a stiff batch of buttercream for the flowers' center cones upon which you will add the petals. Fill one side of your piping bag with a lighter shade of whichever color you're using and make sure the sharp end of your petal tip is aligned with that side. One more thing. When you're mixing colors add the dye in little by little. I use a toothpick to swipe in some color then mix and add more if needed. If your colors look a but too bright add a TINY bit of black in to tone things down. I really love the idea of lavender and tea! Sounds delicious! This looks amazing! I have a question – is there a particular reason why you chose to fill it with American buttercream instead of doing Italian meringue throughout? I am not a huge fan of American buttercream and have been looking for alternatives that are still stiff enough to decorate with. Thanks! I totally understand! You can absolutely use Italian meringue buttercream for the inside of the cake! Hope you enjoy! I am loving the way this sounds! Any tips for baking cupcakes with this cake recipe? Use the same cake recipe for cupcakes! Bake for about 15 minutes instead of 30-35! Hope you enjoy! Looks so beautiful! I’m curious what brand of food colouring you use, as I have had trouble finding a reliable brand in the past. I use gel food coloring from AmeriColor Corp! They’re great! Hi John, I recently discovered you on YouTube and being a baker/decorator myself of many years experience, I simply LOVE what you do! Your work is is simply gorgeous. I’ve been bing(e)ing on your different recipes & yes, copying them, and I love the flavor of Lavender. You infused the flowers in milk, but I discovered recently that Trader Joe’s sells (shelf safe) Lavender Blueberry Almond Milk & it’s divine. I will be trying out the cake using this but I’ll add a little cream to make the milk a little richer. Will let you know the results as soon as I’ve done it. Did you try making the cake? I’d love to hear how it turned out!